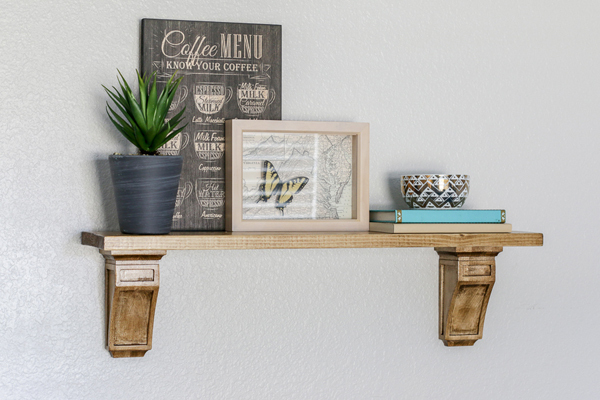 IHeart Organizing: UHeart Organizing: DIY Wall Shelf with Corbels! 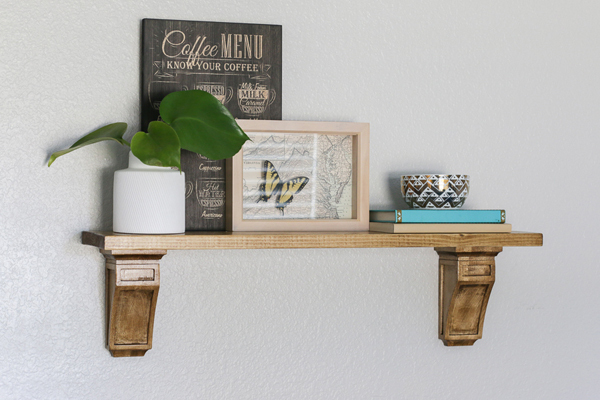 7 UHeart Organizing: DIY Wall Shelf with Corbels! Wall shelves make my organizing heart go pitter patter. They quickly free up surface space by going vertical, and they are also a wonderful way to combine form and function. Mix and match your favorite collections and accessories with storage boxes, canisters and trays and you are well on your way to a stylish and functional space. I especially love to use smaller wall shelving in entryways as the base of a command station, in bathrooms over the toilet or hamper and even in kitchens for dishes and cooking items. And while there are times when the stars align and you are able to find a shelf that is the perfect size, width, depth and color; purchasing exactly what you want and need isn't always feasible. But no fear, my pal Jen is here! 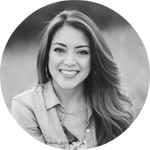 She is a pro at offering up simple building solutions for areas all over your home, and I am so honored that she shares those builds and tips with us. So, if adding a shelf or three is on your current home checklist, then she has you covered with a fabulous DIY solution. Hello iHeart Organizing friends! 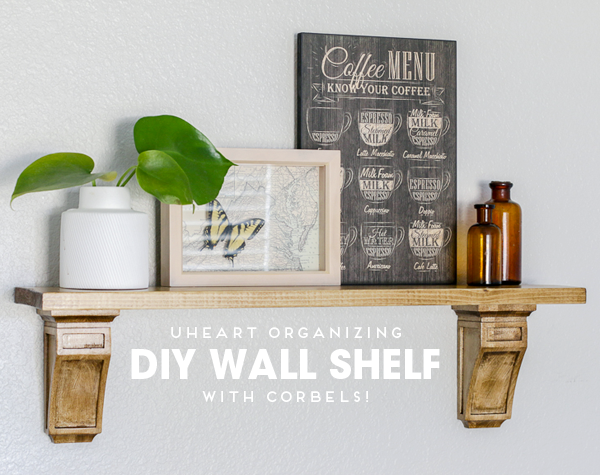 I’m excited to be back here, sharing my easy DIY shelf with corbels with you! Whew. It’s been such a fun and busy year, hasn’t it? I can’t believe it’s almost over! Thank you for allowing me to share my easy drawer dividers and kids’ lunch organization earlier this year. I’m guessing you’re about knee-deep in Thanksgiving meal-planning and hosting family and friends in your homes. We certainly are and it’s a mad dash to get everything done in time! I love this time of year, even though it’s the most hectic. I’m always thinking of ways to make our guest room a little more accommodating and this easy DIY shelf with store-bought corbels is sure to make your guest room or bathroom a little more functional and pretty. 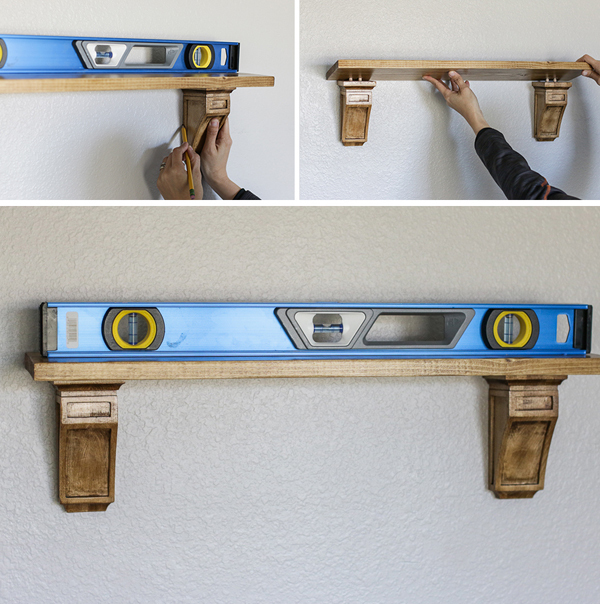 This DIY shelf will only take a day or so to complete. Let’s get started so you can focus on more important things… like turkey and dressing. Don’t mind me, I’m just going to be carb-loading over here like it’s my job. 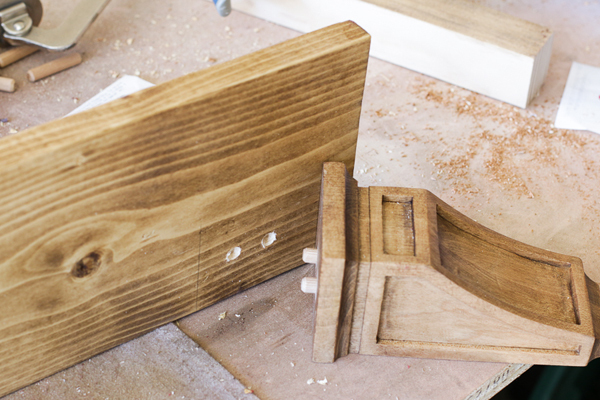 First, you’re going to want to make a jig. Basically, it’s a template that you make so that your drill holes will be identical. 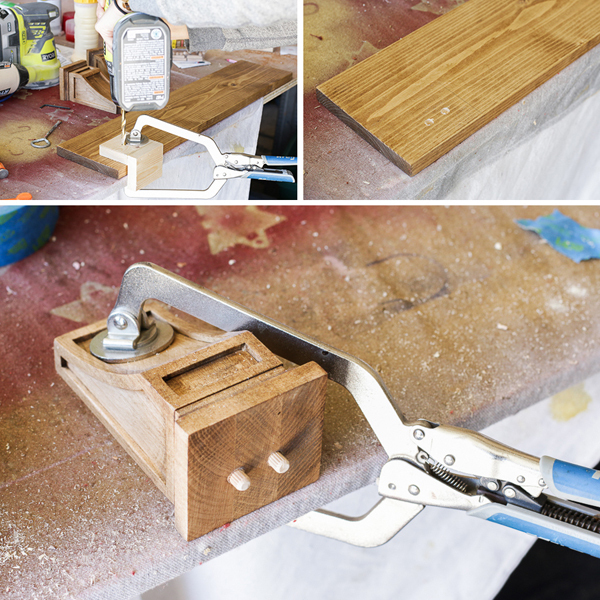 To create my jig, I glued and nailed a couple of scrap pieces of wood together as shown in the photo below. Then, with a 5/16” drill bit, I drilled 2 holes into the jig. 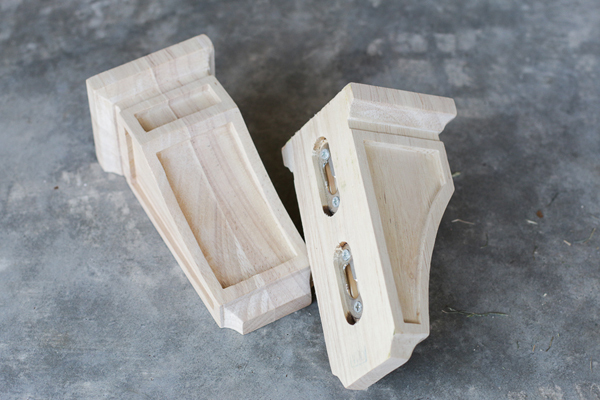 I received these pre-fabricated corbels in the swag bag from a blogger’s conference a couple of years ago. These corbels are made by a Georgia-based company called Osborne Wood Products. They make a variety of turned furniture legs, corbels, and other wood parts. You can find corbels at any big box home improvement store, as well as at architectural salvage yards and the like. I like these because it comes complete with hanging hardware that’s already inset so that the corbels will sit flush to the wall. 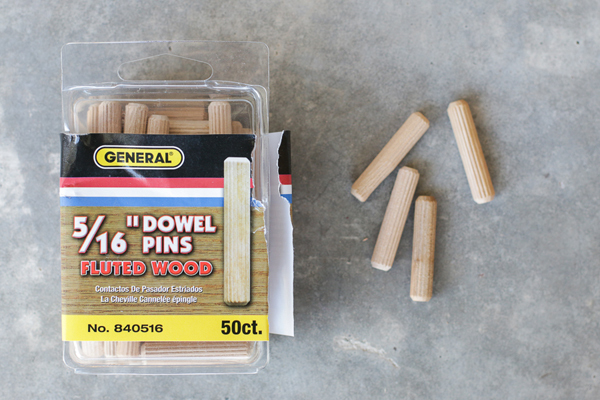 I also picked up a package of 5/16” fluted dowel pins from The Home Depot. Then, using my jig, I clamped the corbels onto my workbench and drilled the holes. 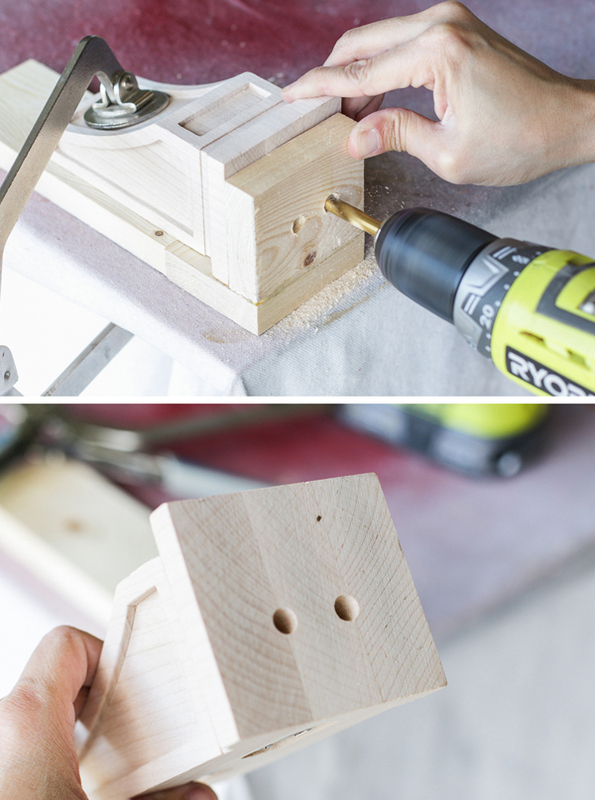 Don’t drill the holes too deep so that when you insert the dowel pins, they disappear. You want the dowel pins sticking out a little. I had a piece of 1x6 scrap wood lying around my workshop, so I decided to use that as the shelf. I sanded and stained the pieces before moving forward. My shelf measures about 24 inches long. You can use your own measurements to fit your space – I would just recommend not making the shelf so wide that it begins to sag. I eye-balled where I wanted my corbels to be, and marked a line. 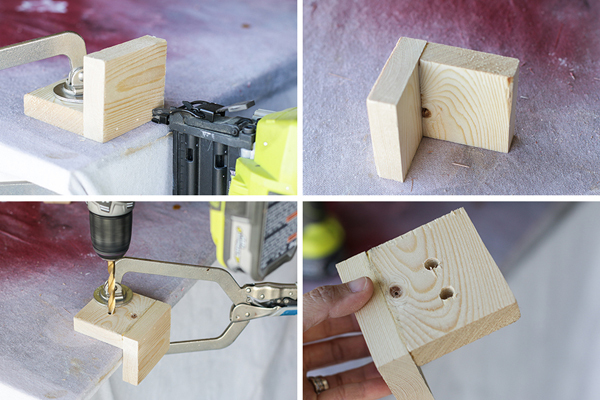 Then, using the same jig, I was able to drill identical holes into the shelf. Insert the dowel pins into the corbel, and the corbel and the shelf should fit together perfectly. 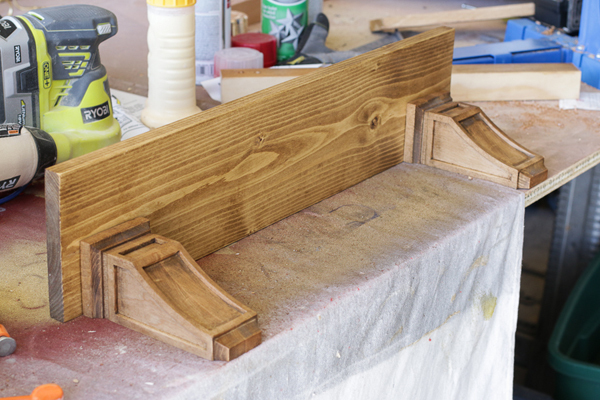 These dowel pins simply make it so that the shelf doesn’t slide around on the corbels. You could also glue and nail the shelf to the corbels once you hang it up on the wall, but being a serial renter (Army wife here), I usually go for the non-permanent solution whenever possible. Now that I’ve dry-fitted everything, it’s time to hang it on the wall! With a stud finder, locate the studs in the wall. Here’s a handy little tip: make a photocopy of the back of the corbels so you know exactly where to place your screws. I put one corbel where I wanted it on the wall and traced a line. Then, holding up my photocopied template, I drilled the screws into place. Be sure not to sink the screws all the way into the wall – you’ll need them to stick out a bit so you can hang the corbels from them. Then, place the shelf and the other corbel on the wall, check for level, and mark the placement. Take the shelf back off, screw the screws into the wall and hang the other corbel. Double-check that everything is still level, adjust as needed, then simply lay the shelf in place! Easy as pie. Great. Now I want pie. This easy DIY shelf with corbels would look great in a guest room or the guest bathroom, right? Right. Okay, now let’s go bake that pie. Thanks to Jen for having me. If you’re looking for more easy DIY building projects, be sure to swing by and say hello! Wishing you the happiest of holidays, friends! I love this idea! Jen makes it look so easy. Her photocopied template is genius. That photocopying tip is genius! Love this! The photocopy technique is so smart! Some great tips! I especially love photocopying the back of the corbel and using that to mark your screw holes. 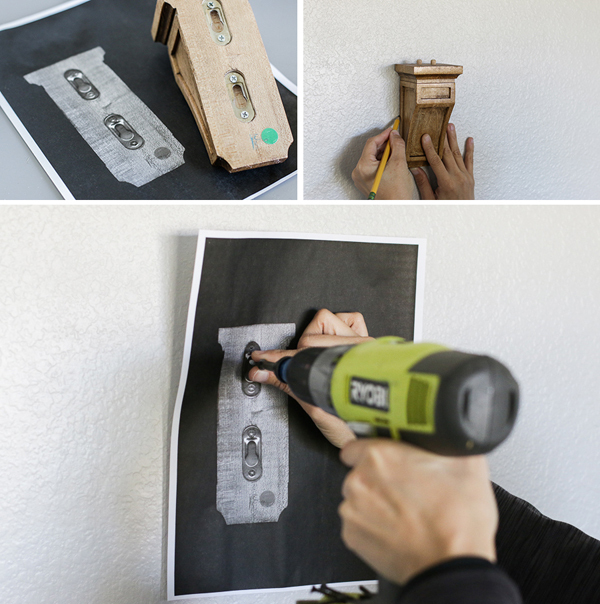 I could also do this for hanging framed photos and small art work. Love this! I've never seen someone photocopy what they are putting on the wall like that! Brilliant! Also--loved the jig tutorial at the top! I definitely learned a lot from this post. Thanks! Love the white vase on the shelf! Where is it from? Where did you get your coffee board print?